So recently I posted a quick example of using the new layout guidelines to design an imaginary calendar application to the VDG blog. As it says in the post, this design is by no means complete. Would you all be interested in helping to really flesh out this design? This is, for the most part, a design exercise. No developers have been identified to implement this design so there's no guarantee that this would be end up on your favorite desktop. But who knows? At a minimum, it will be a great way to learn together and help to expand our skill base so we can tackle other design projects the community needs. So what's missing? A day view, a month view, adding an event. What else can you think of? The latest mockup toolkit has this calendar app mockup in it so you don't have to start from scratch. I'll be here to help on any aspect of the visual design as well as helping to interpret and apply the visual design guidelines. I'm sure Thomas (colomar) is willing to chime in from time to time to help with any usability or interaction design questions. Great idea to let our wonderful community loose on the design! And yes, I'm of course always glad to provide usability input. First of all, I really *really* like the design! Major kudos to all involved! Week and Month views are both very useful to have, but serve different needs – week for actual planning of the work week (e.g. “what do I have to do today or tomorrow?”, “can we plan this meeting for next week?”) and month for a longer-term planning and overview (e.g. “does anything clash with me going to Akademy this year?”, “do I have enough time to take that extra exam in two months?”, “when can I finally take a vacation?”). Personally the only use for the Day view that I see on anything that has a bigger screen then a smartphone, is when you import a calendar of a multi-track conference like FOSDEM or LinuxCon. And even then, there are special apps that handle this much better on the smartphone. For me tag/context colour is more important than calendar colour – I need to know what I have to have near me at that point in time, not whether it’s from my private, work or outside/shared calendar. I imagine there are people with very different use cases here, so I’d be happy with just having that as an option, if not the default. A while ago I even proposed the idea of Striped multi-colour entries (events, tasks) in KOrganizer, but I’m not sure it’s doable at all. What is missing in the mockup is how to access/view additional information – the longer description of the event, location, any attachments, participants, etc. To avoid clutter a solution might be to change the Agenda and Calendars (maybe even the tiny month view below) parts into the Event details part, once you click on an event; and when you click outside of an event, the Agenda and Calendars views could show up again. My reasoning is that when looking at an event’s details, you don’t need nor want to see two overviews of your calendars – and the more useful one at that time is in the main pane of the window anyway; and when you want to see an agenda and enable/disable calendars, you’re dealing with a bigger picture, not a specific event. I am also wondering how full-day events and public holidays will be displayed. It is not transparent to me how I could navigate to a different year in this mockup …other then by clicking the next month (week?) button in the mini-month-view way too often. For reasons stated below, I would like people to rethink the ToDo/tasks part of KOrganizer or just make Zanshin take over that part. Usually I have 6 calendars added at the same time – 1 read-only .ics via HTTP of our hackerspace’s programme to see what’s going on and 5 read-write via CalDAV hosted on my ownCloud server and synced with my smartphone(s). The latter include a Work, Private, University, General celebrations & what’s going on (e.g. when’s DocumentFreedomDay or SysAdmin Day, Museum Day etc.) and Birthdays. On a normal day Eventlist is my first contact with my calendars. I use 4 different Eventlist plasmoids divided into a grid on my Working desk Activity’s desktop, where each of the plasmoids represents a context and therefore the events and todo’s are filtered accordingly: Home/Office (incl. computer work, home chores, phone calls, things where I need a desk), Chores outside (incl. meetings, need to go out to buy something, phone calls, etc. ), Exams & What’s Going On (university work, hackerspace’s programme, concerts, birthdays and basically everything else), Waiting for & Delegated (tasks that are out of my hands, but I need to track in order to work on my stuff). This setup is great for having a context-based overview, but (still) pretty **** for editing or ticking off a todo/task as done. For editing the calendars I use KOrganizer, where I have a different colour set for each calendar (outside colour) and each tag (inside colour). Most of the tags represent the contexts/environments I will need to be in to do this task: Home, Desk, Chores outside, Computer, Meeting, “Phone” call, Delegated & waiting for; There are a few like e.g. : Travel, Special occasion, Exam (soon to be depricated together with the University calendar, ha!). The context tags I use also for tasks, the others I don’t. And the tag colours are re-used in Eventlist, so it makes up a very readable overview. To avoid clutter, I disabled todos in the Agenda views (i.e. Day, Week, Month), but for adding and editing events I find KOrganizer very useful. Zanshin is my weapon of choice for managing ToDos/tasks. I use it pretty much the way the developers intended – as you can see above, I have a few contexts/tags that make sense and I organise the tasks in separate projects and tagged with appropriate context. I also regularly use its todo: KRunner to quicky add new tasks/brainfarts to its inbox for later processing and organisation. Zanshin has IMHO a much improved interface for managing tasks, compared to KOrganizer; but I realise that this could be just my personal preference. One downside that Zanshin has in its current form is that it doesn’t have the option of a flat view, which is useful if you want to see all tasks in a chorological order, regardless of their context/tag – for this I have to resort to KOrganizer’s Tasks view. Another issue, that I think is being worked on right now, is that it does not handle notes or attachments (the same is true for Eventlist, or basically anything but KOranizer), this is important for me for the usage below. Last, but not least, I actually make use of KMail’s Create task (from mail) feature, since much of my job (for FSFE) is done per e-mail, so it is often useful to append e-mail as extra information to tasks (e.g. FS legal/licensing enquiries) and it is easier to create tasks from there as well. The biggest issue with this is, as mentioned, that I cannot access that attached extra info (usually mail) from either Eventlist, Zanshin, the clock/calendar plasmoid, or anything except KOrganizer, which as said, I don’t like using for managing todo/tasks. The other problem is that if a mail (or file, whatever) is part of a todo/task, I would expect it to be marked as such in KMail, but currently it isn’t. For additional information, please see my Brainstorm proposal for a “Better & unified ToDo system”. Sorry for banging on my own drum, but I think linking to the original whole thread is a better choice. I add new tasks either via the KRunner, or KMail, in whichever Activity they currently are …but would love to be able to use more apps to create tasks. I check which tasks and events need to be done, primarily from the Eventlist plasmoid(s) in my main “Working desk” Activity, so I can always have an overview ready when I’m doing something …but it would be amazing if I could at least mark a todo/task as done or access details (including attachements) from there or from the clock plasmoid, or in any other easy and unobstrusive way. 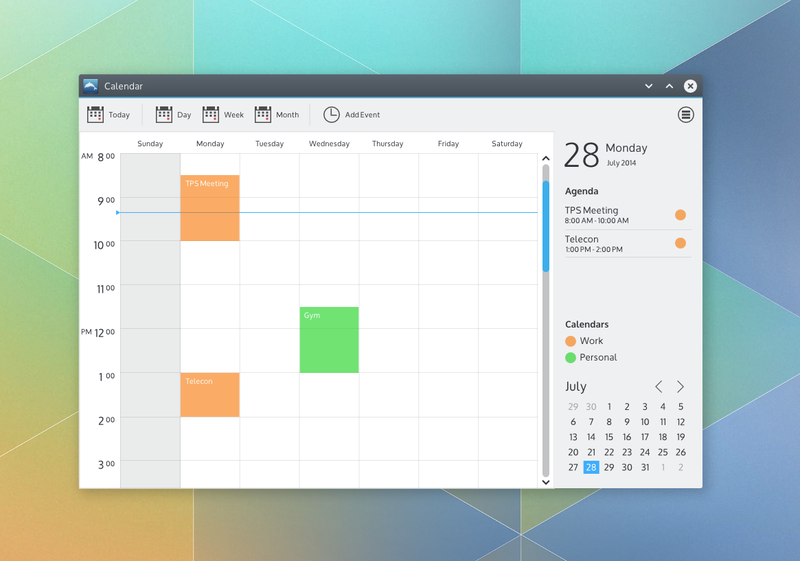 In KDE 4 the calendar in the clock plasmoid is still to clumsy and cluttered, but I really like how it’s developing in KDE 5 so far, so I really hope to include that into my daily workflow soon. Last edited by hook on Mon Aug 04, 2014 7:16 am, edited 1 time in total. Wow, you're a serious self-organizer! I guess we can safely call you a "power user", and your detailed usage description is very useful for finding out what that group needs. Let's see how we can support users like you without making the UI too complex for "light users". Well, I wear many hats (mostly around FS and digital freedom) plus (try to) a private life and finishing my studies. That in practice means a constant suply of ~2000 calendar entries¹ that span over several dozen projects. Juggling all that as well as having several interests (like KDE) demands some serious organising. PIM is sadly very underrated and I think this is because on one hand there are many people who don’t need it and on the other for the ones that do, it’s a source of frustration. Simply because it contains your work, your projects, blood, sweat and tears, your personal life …in fact, it’s probably the most intimate piece of code out there. Therefore the user gets often frustrated already by the content that the PIM suite provides, even in a perfectly working one. If though there’s any bug whatsoever, it hurts the user even more than any other bug. The same goes for the user experience – any teeny tiny extra bit of work that the PIM suite demands from you, even one single additional click, extrapolates the frustration of the user. The PIM suite should make people’s lives easier, that’s why it’s so hard to code for. I want to take this opportunity to thank all the coders, designers, thinkers and everyone at all involved with KDE PIM for the awesome work they have done in the past and continue to do. I love what you do and thank you for making my life easier! Please do keep up the good work and people who haven’t thought of working on KDE PIM – please step up and help! It’s relatively constant, since a) I delete finished tasks or projects after max. a month and b) KOragnizer automatically moves all entries that are older then one year into an archive calendar. I hope I’m using this buzzword right – I dunno what’s the difference between it and usability or usefulness of the user interface. Thanks hook for the excellent thoughts! This kind of information is so incredibly helpful for designing an application. And trust me, I'm convinced that *all* of the high capability functions you mention could be reflected in the design while keeping the interface approachable for other users. I'm definitely curious how the community here would evolve the design with your comments in mind! alake wrote: Thanks hook for the excellent thoughts! This kind of information is so incredibly helpful for designing an application. And trust me, I'm convinced that *all* of the high capability functions you mention could be reflected in the design while keeping the interface approachable for other users. I’m looking forward to it as well! Getting PIM right is challenge, but if anyone can do something that is suited both for power and lightweight users, it’s KDE! I added an “in short” summary in my first post, that I hope will make things a bit more understandable – I think the major challenge is to make PIM get out of your way when you don’t need it and serve you exactly what you need when you do. Kind of like a seasoned butler (possible inspiration for a new name for some PIM apps/suite, hehe?). A 4 weeks kind of view is missing, while the month view it's though to help you plan ahead it doesn't work that way by the end of the month, and that is because it is not designed to show you what's upcoming, but only to show the entire month.